Deshazte De Tus Prejuicios -- ¡Contra La Políticamente Correcto! Immigration Destroys Your Identity -- Get Rid Of Your Prejudices -- Against The Politically Correct! 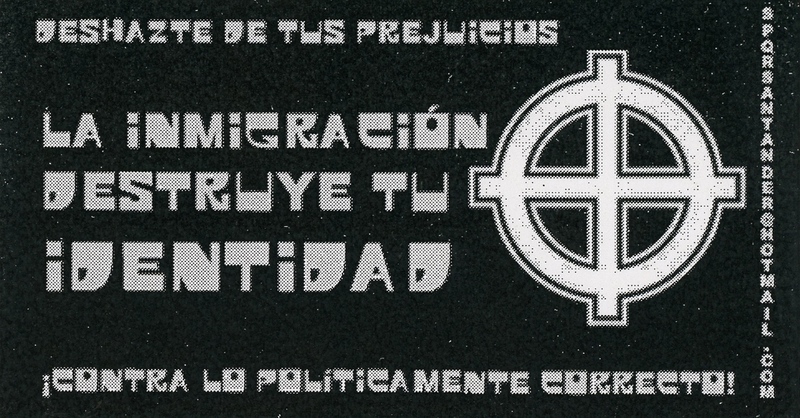 This sticker contains the logo for white pride, a white circle with a cross going through it. The sticker has a black background that makes the white logo and white text stand out. This logo is mainly used by white nationalist, white separatists, neo-nazis and white supremacists. The message on the sticker is clear and very anti-immigration with no regard to what is or is not politically correct.